A blog to indulge two greatest interests - amateur astronomy and the internet. Fact2: When a comet approaches the sun the ice melts and releases the particles from the main body. 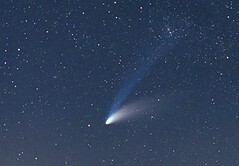 Fact3: The tail of a comet always points away from the sun. As the picture below shows, there are in fact two tails, both curved, and they are 30 MILLION kilometres long. That's a lot of fine particles. The theory is that the solar wind is responsible for the blue gas and gravity alone for the larger particles.